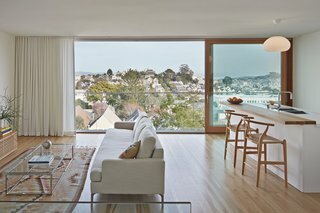 Ryan Leidner Architecture was brought in to reimagine a house from 1941 making the expansive San Francisco views a priority. The Grandview home’s footprint had to remain the same due to strict zoning laws which also meant they couldn’t add a deck. With those limits in place, the top floor living room and kitchen area were designed to become an outdoor-like space with floor-to-ceiling glass doors that slide to either side making the room feel completely open. With the glass railing, the opening feels like you’re on an outdoor deck. The new kitchen features white laminate plywood cabinets paired with quartz countertops to keep a minimalist look as not disrupt the views. Walls on the top floor that once kept the living room and kitchen separate were removed to open the space up. Downstairs was also reconfigured to now include a new master suite. Ryan Leidner uploaded Grandview House through Add A Home.